Bring us your design ideas and we will make them a reality. 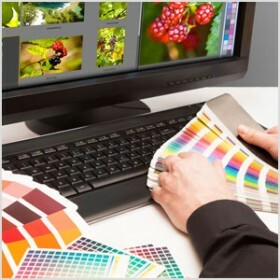 Our in-house team of professional graphic designers can help you achieve your creative goals. Because image is everything in the business arena, it’s important to look polished and professional. At GVC, we work closely with our clients to help them create impactful documents and presentations. Whether it’s a product brochure, logo design or corporate announcement, we provide our customers with creative solutions that help them surpass their competition.